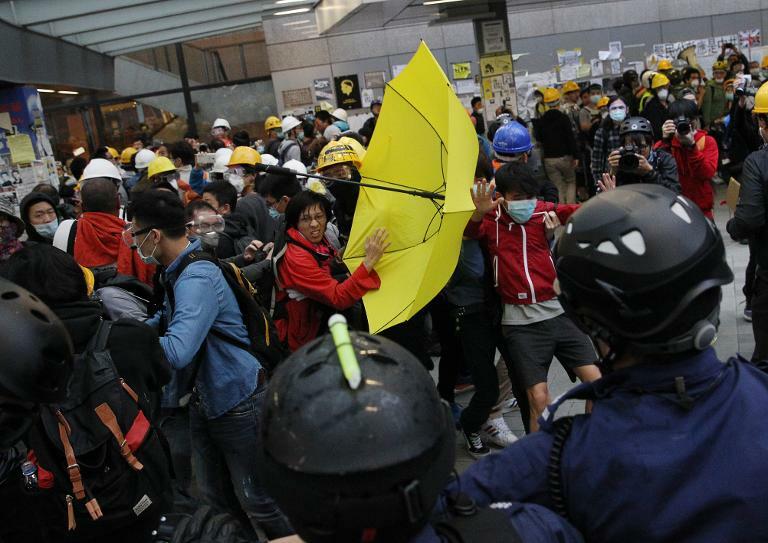 Hong Kong’s leader said Monday that pro-democracy protests were “in vain” after police used pepper spray and batons on students trying to storm government headquarters, in some of the worst violence since the rallies began. With the student-led protests now into their third month and frustrations mounting, Chief Executive Leung Chun-ying hinted that further police action may be imminent, in his most forceful comments in recent weeks. “I have pointed out before that Occupy Central is not only illegal but it will also be in vain,” Leung said, describing the continued protests as “intolerable”. “Now the (public) demand for police clearance is increasing. From now on, police will enforce the law without hesitation,” he told reporters. On Monday afternoon the high court granted an injunction ordering the clearance of several parts of the major protest site in Admiralty district, according to bus operator Kwoon Chung, which made the application. 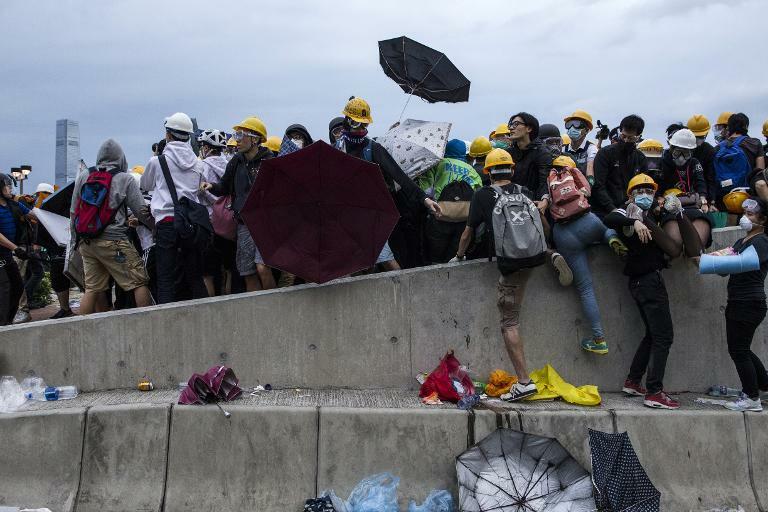 It approved the removal of “obstructions” to traffic on and around stretches of Harcourt Road, a multi-lane highway through the heart of the financial district currently blocked by barricades and hundreds of tents. Police have previously waited for such injunctions before moving in to clear roads. The government offices in Admiralty were closed on Monday morning and the city’s legislature suspended after protesters broke through police lines and occupied a major road outside the complex overnight. After a night and morning of intermittent violence student leader Alex Chow told reporters that democracy groups would discuss the way forward for the movement in the coming few days — “whether to advance or retreat”. Protesters began staging mass sit-ins on major roads in three districts on September 28, demanding free leadership elections for the semi-autonomous Chinese city in 2017. China’s communist authorities insist candidates for the election must be vetted by a loyalist committee, which the protesters say will ensure the election of a pro-Beijing stooge. There was frustration and pessimism in Admiralty Monday following the clashes. “We feel a mixture of things: angry, tired, upset. All the emotions are quite negative and tense,” said student Eppie Chan. Police arrested 40 people and 11 officers were injured in the overnight clashes, a spokesman said. A total of 37 people received hospital treatment. Authorities said they had “no other choice” but to use pepper spray and batons to force back protesters from the government complex. But some demonstrators said they had been unfairly targeted. “They (police) are supposed to protect the citizens, not (hurt) us. We saw what they did so we don’t trust them any more,” said account clerk Justin Yan, 22. Others voiced doubts over the direction of the movement. “The crowd was not prepared for the battle last night… they were put into a difficult situation and didn’t know how to handle it,” said translator Mayson Ng. The Admiralty site had calmed by Monday afternoon after a chaotic morning which saw protesters at a nearby shopping arcade clash with police. The protests drew tens of thousands of people at times during their first weeks, but numbers have dwindled as the movement’s leaders struggle to keep up momentum. Frustrations have grown amongst the demonstrators as Beijing refuses to budge on the vetting of candidates, while support for them has waned among residents weary of the transport disruption. Police cleared a protest site in the Mongkok district last week, making more than 140 arrests, but sporadic scuffles have continued there. A smaller camp blocks another busy road in the shopping district of Causeway Bay. A British colony until 1997, Hong Kong enjoys civil liberties not seen on the Chinese mainland, including freedom of speech and the right to protest. But fears have been growing that these freedoms are being eroded under Chinese rule. The city’s financial secretary John Tsang said Monday the continued protests could harm the city’s economy in the long run.